The *Delhi Drupal community* is organizing the *Drupal Camp 2012* on *08 Dec* at the *JNU Convention Centre*, New Delhi. The keynote address would be delivered by Jacob Singh, Regional Director, Acquia India. 12 speakers from Delhi NCR, Pune, Hyderabad, Bangalore, Kolkatta, and Chennai are gathering together to deliver sessions covering Performance, Responsive Design, Web Services, Node.js, Code versioning with Git, VOIPand a host of other interesting topics around Drupal. There will be a Drupal CXOs meet, followed by an introduction and an interactive Q&A session by Avienaash Shiralge on Agile/SCRUM. Avienaash is a leading Agile Transformation coach and trainer. 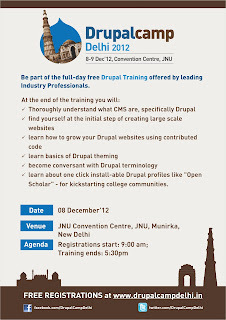 A day long *Drupal-in-a-Day* training is being organized led by 2-3 highly experienced Drupal trainers on the same date. We're following up on *09 Dec* with a hackathon, with an objective to contribute to the development (documentation, reviews, code, QA) of Drupal 8. Professionals experienced and engaged with Drupal for a few years are expected to be participants here. Most of the speakers would be participating. Please find attached the posters for the event. If more details or help is required please do write to us.